Basseterre, St. Kitts (SKNIS): The formation and execution of a six-point plan of action for Division ‘B’ in 2013 has had a profound impact on public safety in the communities. Superintendent Terrance James, Outgoing Commander for Division ‘B’ which spans West Farm westwards to Lodge, said the plan was primarily modeled from the 2012 to 2014 Strategic Plan for the Royal St. Christopher and Nevis Police Force. Increased patrols were included under crime fighting initiatives and officers across the division were dispatched on differing routes. The heightened police visibility paid off. Four persons were reportedly arrested and charged for this violation of the law. Other successful initiatives from the six points were walkthroughs of the community, town hall meetings, regular visits to schools, training for frontline supervisors, dynamic and stealth house clearing courses, while road signage was refreshed. Renovation work was also carried out at the Old Road, Sandy Point and St. Paul’s Police Stations while a new building was constructed in the Tabernacle community. 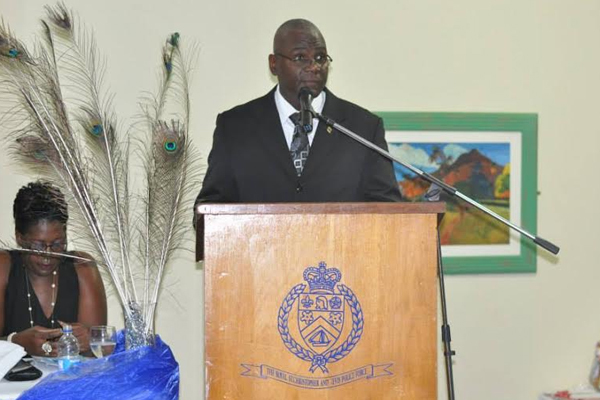 The Incoming Commander of Division ‘B’ Superintendent Cromwell Henry revealed that efforts to safeguard the public will continue. “As the new head of this division, along with my team of motivated middle managers and supervisors, we pledge to continue to motivate the men under our charge so that they will continue to serve the communities within which they live and work in order to make our Federation a better place,” said Superintendent Henry. He concluded by thanking the rank and file of the police force across the division for their hard work to date.